John Tyler ( March 29, 1790 – January 18, 1862) was the tenth (1841-1845) President of the United States. A long-time Democrat, he was elected Vice President on the Whig ticket and on becoming president, in 1841, he broke with that party. His most famous achievement was the annexation of the Republic of Texas in 1845. He was the first president born after the adoption of the U.S. Constitution and the first to assume the office of President upon the death of his predecessor (William Henry Harrison). 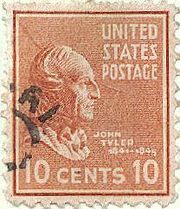 John Tyler was born the son of John Tyler, Sr. (1747-1813) and Mary Armistead (1761-1797), in Charles City County, Virginia, as the seventh of eight children. He was educated at the College of William and Mary and went on to study law with his father, who became Governor of Virginia (1808-1811). Admitted to the bar in 1809 and commenced practice in Charles City County. He served as a captain of a military company in 1813 and became a member of the Virginia State house of delegates 1811-1816 and was later a member of the council of state in 1816. Tyler was elected as a Democratic Republican to the Fourteenth Congress to fill the vacancy caused by the death of John Clopton. He was reelected to the Fifteenth and Sixteenth Congresses and served from December 17, 1816, to March 3, 1821. Tyler declined to be a candidate for renomination in 1820 because of impaired health. He became a member of the Virgina State house of delegates 1823-1825. Tyler was elected to be the Governor of Virginia (1825-1827). Tyler was elected as a Jacksonian (later Anti-Jacksonian) to the United States Senate in 1827, he was reelected in 1833 and served from March 4, 1827, to February 29, 1836 when he resigned. He served as President pro tempore of the Senate during the Twenty-third Congress, and was chairman of the Committee on the District of Columbia (Twenty-third and Twenty-fourth Congresses), as well as the Committee on Manufactures (Twenty-third Congress), a member of the Virginia State constitutional convention in 1829 and 1830 and a member of the Virginia State house of delegates in 1839. He was drawn into the newly-organized Whig Party, Tyler was elected vice president in 1840 as running mate to William Henry Harrison. Their campaign slogans of "Log Cabins and Hard Cider" and "Tippecanoe and Tyler too" are among the most famous in American politics. He was inaugurated March 4, 1841, and served until the death of President Harrison on April 4, 1841. Tyler took the oath of office as President of the United States on April 6, 1841, and served until March 3, 1845. He did not seek reelection. Tyler was the first Vice President to assume the Presidency in this manner. He acceded to the Presidency upon the death of President Harrison on April 4, 1841, and took the Presidential oath of office as specified by the Constitution on April 6. The Cabinet and U.S. Congress agreed with Tyler that he was President and not merely Acting President of the United States, and as the Constitution was not explicit on that aspect of succession (until the 1967 ratification of the 25th Amendment), both the House and Senate passed resolutions recognizing Tyler as President. After his presidential career Tyler became a delegate to and president of the peace convention held in Washington, D.C. in 1861 as an effort to devise means to prevent the impending war. Tyler was a delegate to the Confederate Provisional Congress in 1861; elected to the House of Representatives of the Confederate Congress, but died in Richmond, Va., January 18, 1862, before the assembling of the Congress. He is buried in Hollywood Cemetery. Mary Tyler ( April 15, 1815 - June 17, 1847). Robert Tyler ( September 9, 1816 - December 3, 1877). He was married to Elizabeth Priscilla Cooper who served as First Lady of the United States. 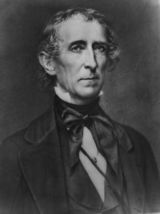 John Tyler, Jr. ( April 17, 1819 - January 26, 1896). Letitia Christian Tyler ( May 11, 1821 - December 28, 1907). Anne Contesse Tyler ( April 5, 1825 - July, 1825). Alice Tyler ( March 23, 1827 - June 8, 1854). Tazewell Tyler ( December 6, 1830 - January 8, 1874). David Gardiner Tyler ( July 12, 1846 - September 5, 1927). John Alexander Tyler ( April 7, 1848 - September 1, 1883). Julia Gardiner Tyler ( December 25, 1849 - May 8, 1871). Lachlan Tyler ( December 2, 1851 - January 26, 1902). Lyon Gardiner Tyler ( August 24, 1853 - February 12, 1935). Robert Fitzwalter Tyler ( March 12, 1856 - December 31, 1927). Pearl Tyler ( June 20, 1860 - June 30, 1947). Altogether, Tyler was the father of at least 15 children, more than any other President before or after him. His youngest child, Pearl, died 100 years, 1 week, and 6 days after the death of his eldest daughter, Mary. His presidency was rarely taken seriously in his time, he was usually referred to as the "Acting President" or "His Accidency" by opponents. Further, Tyler quickly found himself at odds with his former political supporters. Harrison had been expected to adhere closely to Whig Party policies and work closely with Whig leaders, particularly Henry Clay. Tyler shocked Congressional Whigs by vetoing virtually the entire Whig agenda, twice vetoing Clay's legislation for a national banking act following the Panic of 1837 and leaving the government deadlocked. Tyler was officially expelled from the Whig Party in 1841, a few months after taking office, and became known as "the man without a party." The entire cabinet he had inherited from Harrison resigned in September, aside from Daniel Webster, Secretary of State, who remained to finalize the Webster-Ashburton Treaty in 1842, demonstrating his independence from Clay. For two years, Tyler struggled with the Whigs, but when he nominated John C. Calhoun as Secretary of State, to 'reform' the Democrats, the gravitational swing of the Whigs to identify with "the North" and the Democrats as the party of "the South," led the way to the sectional party politics of the next decade. The last year of Tyler's presidency was marred by a freak accident that killed two of his Cabinet members. During a ceremonial cruise down the Potomac River on February 28, 1844, the main gun of the USS Princeton blew up during a demonstration firing, instantly killing Thomas Gilmer, the Secretary of the Navy, and Abel P. Upshur, the Secretary of State. Tyler's future second wife, Julia Gardiner, whom he met two years earlier at a reception was also aboard the USS Princeton. Her father, David Gardiner was among those killed during the explosion. Tyler and Gardiner were married not long afterwards in New York City, on June 26, 1844. Tyler advocated annexation of Texas to the Union. Whigs opposed this expansion because it would upset the balance between North and South and risked war with Mexico. When the Senate blocked a treaty (which needed a 2/3 vote), Tyler annexed Texas through a joint resolution that passed the House 132-76 and the Senate 27-25 in the last days of his term. In 1843, after he vetoed a tariff bill, the House of Representatives considered the first impeachment resolution against a president in American history. A committee headed by former president John Quincy Adams concluded that Tyler had misused the veto, but the impeachment resolution did not pass. Tyler retired to a plantation, named "Walnut Grove", he had bought in Virginia, renaming it "Sherwood Forest" to signify that he had been "outlawed" by the Whig party and withdrew from electoral politics, though his advice continued to be sought by states-rights Democrats. Tyler had long been an advocate of states' rights, believing that the question of a state's "free" or "slave" status ought to be decided at the state level, with no input from the federal government. He was a slaveholder for his entire life. In February 1861, Tyler re-entered public life to sponsor and chair the Washington Peace Convention. The convention sought a compromise to avoid civil war while the Confederate Constitution was being drawn up at the Montgomery Convention. When the Senate rejected his plan, Tyler urged Virginia's immediate secession. Having served in the provisional Confederate Congress in 1861, he was elected to the Confederate House of Representatives but died of bronchitis and bilious fever before he could take office. Given that he was in Texas on his way to the House of Representatives when he died, Tyler was technically the first U.S. President to die in another country. His final words were "Perhaps it is best." Tyler is buried in Hollywood Cemetery in Richmond, Virginia. The city of Tyler, Texas is named for him.